Our South West Campus at Bunbury is Western Australia’s largest university campus outside the Perth metropolitan area. Here you can study courses in business, engineering, health sciences, nursing, teaching, science and social work. You can also complete a University Preparation course or explore your entry options as an Aboriginal and/or Torres Strait Islander student. With our great facilities, small class sizes and on-campus accommodation, ECU South West is a relaxing environment for learning and socialising. From Semester 1, 2019, students at our South West Campus will be able to study Environmental Management & Conservation Biology as a double major within the Bachelor of Science course. This is a 3-year full-time or 6-year part-time course, leading to a range of possible career options in areas like wildlife conservation, land management and environmental science. For more information, visit the Bachelor of Science course page. South West students can now study the Bachelor of Health Science, choosing from three on-campus majors: Nutrition, Health Promotion and Occupational Safety and Health. For details about the course and the majors available to study in Bunbury or online, visit the Bachelor of Health Science web page. South West students also have the opportunity to study the first year of our Bachelor of Science (Exercise and Sports Science) in Bunbury. If successful in Year 1, students can complete the last 2 years of the degree at our Joondalup Campus. You can now start a 4-year Engineering degree at our South West Campus. After successfully finishing the first year in Bunbury, you'll complete the last 3 years of the degree at our Joondalup Campus. And you can choose from a wide range of Engineering courses at ECU. Students can now study a Master of Teaching in Primary or Secondary education at ECU South West. If you've already completed a Bachelor degree or an equivalent qualification in an area other than Education, you can become a fully-qualified teacher in just two years of full-time study with a Master of Teaching. Fast-track study options are available, allowing you to complete a Master of Teaching in 1.5 years through a Summer or Winter School. If you've previously completed a Graduate Diploma of Education you may have the option to complete a Master of Teaching in only one year. For more information, visit the course pages Master of Teaching (Primary) and Master of Teaching (Secondary). With the support of an ECU scholarship, we can help you realise your ambitions by improving your financial situation and enabling you to successfully complete your course. ECU is at the centre of education and health in the South West. We share a precinct with South West Regional College of TAFE, Manea Senior College, the Rural Clinical School, South West Aboriginal Medical Service, Bunbury Regional Hospital and St John of God Hospital. We also have strong links with the surrounding South West community. 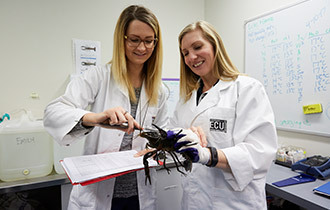 This helps us provide our students with invaluable industry placement opportunities and the practical 'hands on' skills that ECU is known for. Choose undergraduate or postgraduate below to see what you can study at our South West Campus. There are different ways for students to enter our university. 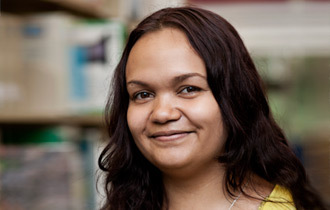 At our South West Campus we have an Aboriginal Student Support Officer who can help you if you’re considering university study. For introductory courses, financial support and other information, please visit our Indigenous Studies webpage. Our South West Campus has a lot to offer students and this goes well beyond teaching and exams. We provide a supportive learning environment through services like career guidance, academic support and general counselling. And our free Peer Mentoring Program helps new students adjust to uni life more quickly by building social and academic networks. Students also have 24-hour access to computing facilities on-campus, ideal for finishing assignments, doing research, or accessing online help with studies. An overview of the courses and facilities at our Bunbury Campus. 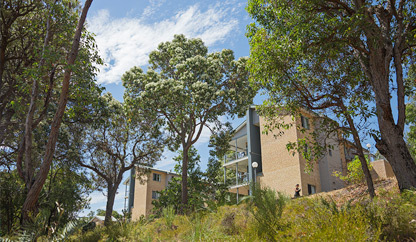 Student accommodation is available at the ECU Village on the South West Campus. Shops and sport and recreation facilities are within walking distance or easily accessible by public transport. For more information, visit the ECU Village website, send an email to bunbury@ecuvillage.com.au, or telephone (61 8) 9780 7630. If you don’t have a car, there are public transport options for travelling to campus. TransRegional provides bus services to the South West Campus. For information on routes and timetables, visit the TransRegional website. South West Coach Lines provides subsidised coach services from Margaret River, Dunsborough, Busselton, Collie, and surrounding regions to the South West Campus. For more information, including how to apply for the subsidy, visit the South West Coach Line website. "I have a family so choosing to study close to home was an easy choice." "Studying at ECU has been a life changing experience. I now have the confidence to be who I want to be. Along the way I have met some of the most amazing people whilst being supported by lecturers who have a passion for their field and a genuine interest in my success. Studying at ECU has been one of the best journeys my life has taken me on." "The lecturers are friendly and supportive, with plenty of knowledge." "I have developed valuable skills during this course. I'm better at time management and more confident in public speaking and conflict management. I chose to study social work, as I wanted to learn about people and society, as well as the methods on how to improve the world around me. I entered ECU by completing the University Preparation Course. I found this path helpful as I gained skills that helped me with my studies." "The staff and lecturers were so approachable." "The campuses are well set out, the facilities on and off campus are fantastic and everyone treated each other with respect As a mature aged student my biggest challenge of coming back to university was essay writing. However the lecturers and learning advisors were great. They gave me lots of feedback, helping me to improve my writing skills." "The prac placements were invaluable." "It was great getting the opportunity to put everything we learned into practice by helping real people while under the guidance of a Registered Nurse. I found my time working with kids in the cancer ward at Princess Margaret Hospital particularly rewarding. The small class sizes meant we had plenty of time with our lecturers. I was qualified and employed as a nursing assistant after the first 18 months of my degree."